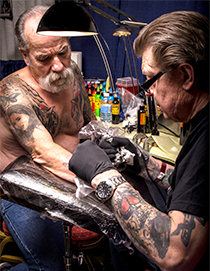 An upcoming exhibit in the Baer and Godschalx galleries will celebrate the art of tattooing and the 50-year career of local tattoo artist Rick Harnowski. 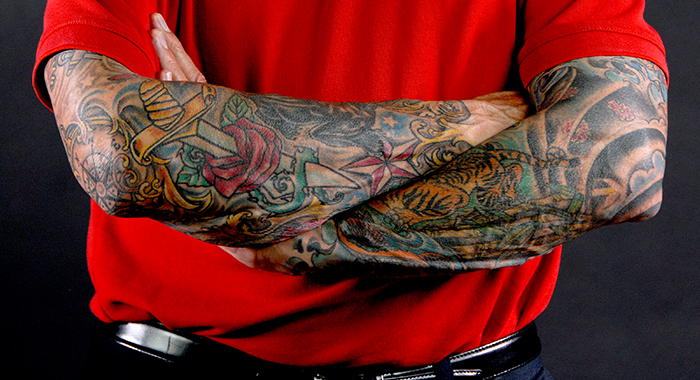 The fine art of tattooing makes its appearance on campus Oct. 8-Nov. 2. The college hosts Rick Harnowski of Green Bay’s Tattoos by Rick in a retrospective exhibition celebrating his 50-year career and the beauty of ink. The Baer and Godschalx galleries will host Harnowski’s exhibit, “The Needle has Moved,” curated by Brian Pirman (Art) and the Rev. Jim Neilson ’88 (Art). Harnowski, a leading proponent of tattooing regulations in Wisconsin, owns and operates the licensed and inspected studio Tattoos by Rick, which Neilson calls a “go-to” place to get inked in the community. Harnowski’s work has been featured in museums, galleries and top tattoo magazines around the world. Known for his imaginative custom pieces, Harnowski has tattooed several members of the Green Bay Packers, including Donald Driver and Charles Woodson. In addition to showcasing Harnowski’s work, the exhibit will celebrate tattooing as an art. Tattooing goes back thousands of years and has gone through periods of scrutiny. But curators Neilson and Pirman have noticed a recent change in the way the art is socially perceived. Both curators say they have noticed more tattoos on the SNC campus, from students and faculty alike. This trend is one of the reasons Pirman and Neilson decided to bring Harnowski to SNC, and they feel the college’s galleries should promote and endorse what the community sees with its own eyes. Harnowski will be a part of a host of interactive experiences taking place throughout the duration of his exhibit. The opening reception on Oct. 11 invites local and international artists and art-lovers alike, and following Thursdays through Nov. 2 will feature real-time tattoo demonstrations by Harnowski and his son, Josh Harnowski ’06. During these demonstrations, gallery visitors will have the opportunity to test out the tattoo guns themselves on synthetic skin. The ultimate goal of this exhibit is to create a celebration of this often-misunderstood art, and to celebrate Harnowski's lifetime work within that art, curators say. Rick Harnowski at work at his destination Green Bay parlor, Tattos by Rick.